Presenting a dollar sign Christmas tree ornament with authentic Swarovski rhinestones. Makes a perfect gift for the banker, financial analyst, or stock broker in your life. Dollar sign Christmas tree ornaments with authentic Swarovski rhinestones can be purchased at Designer Ornaments. 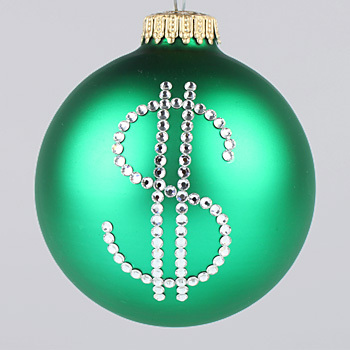 Dollar sign Christmas tree ornaments depicting a cash, money, and dollars can be purchased at Designer Ornaments.